I’m definitely working to branch out color wise, but I do often fall back to my favorite color scheme, purple, black, and grey. I love tank tops and blazers for summer. When it’s warm outside, you can ditch the blazer, but the blazer makes a big difference in air conditioned offices. Adding a statement necklace is a great way to bring the outfit up a notch. I paired the outfit with a multi-strand faux-pearl necklace that I got in Japan. We had a photo shoot at work for corporate headshots last Thursday, so I decided to get some new make-up and a new blazer. I didn’t get a chance to take pictures the day of the shoot, so here’s Friday’s outfit instead. 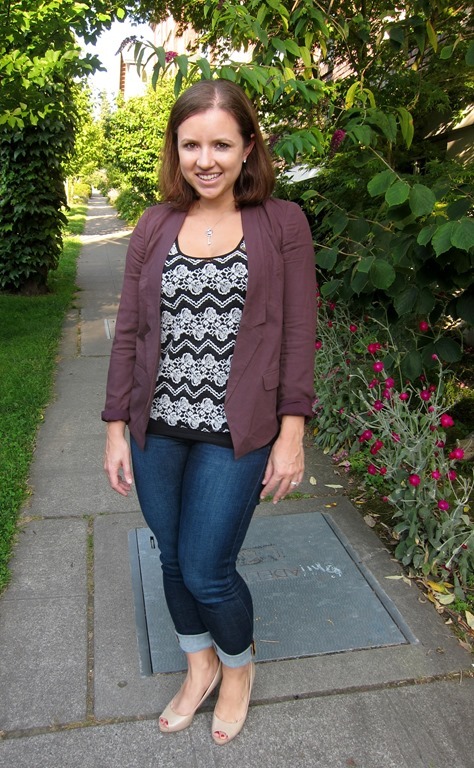 I paired my new blazer with a white tee, statement necklace, my Banana Republic grey cropped pants, and black heels. I love cotton blazers for summer, because they help with indoor air-conditioning, but the lightweight fabric pairs much better with overall warmer temperatures. 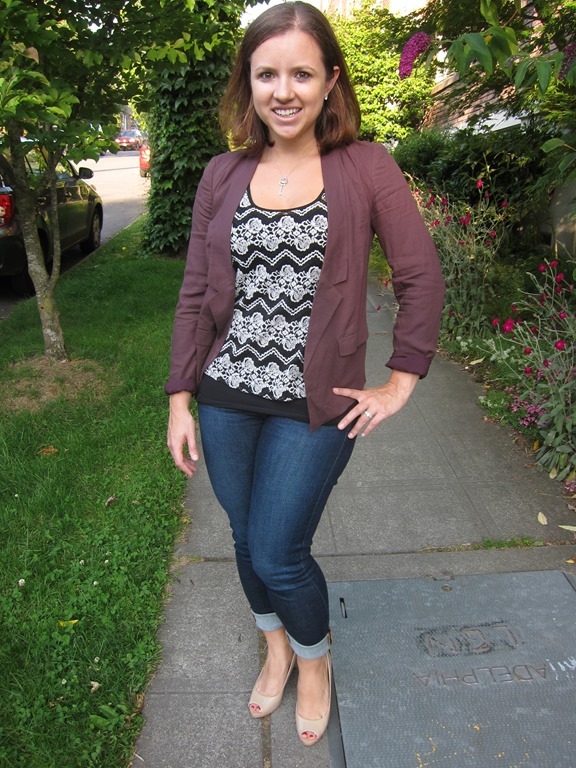 I also think that Nordstrom BP is starting to be my go-to point for great quality affordable blazers! The blazer fit has women’s sizing, I went with the medium (which is size 2-4), and it fits perfectly. 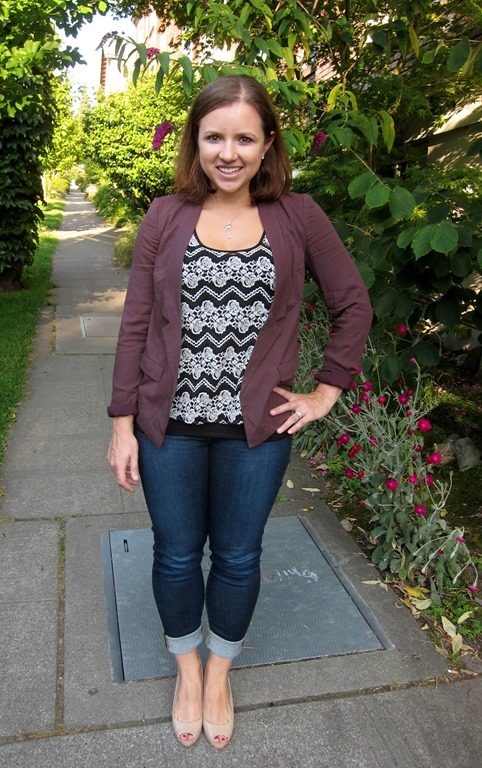 I wore the tan color of my new cropped pants today, and paired them with my navy Zara blazer and a green top. Unfortunately my blisters were still bothering me a bit, so I switched out the heels for my Sperrys. 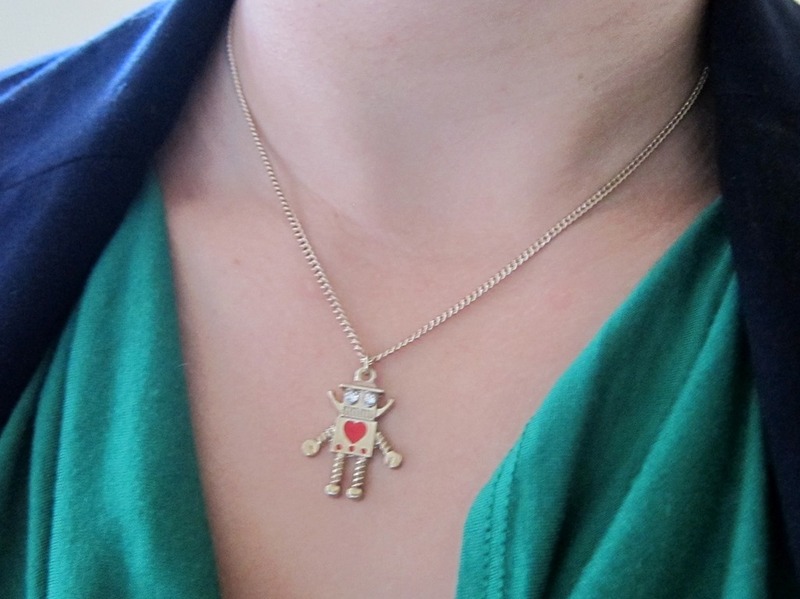 Finally, I decided the outfit needed a little something, so I added my gold robot necklace. Yellow is such a fabulous, happy color, and when I saw that Marion from MarionBerryStyle had picked yellow for her trend of the month challenge, I was really excited. The key with wearing a bright color like yellow is to either play up the brights, and go full-force color-blocking, or tone it down with neutral colors (the latter is more professional). 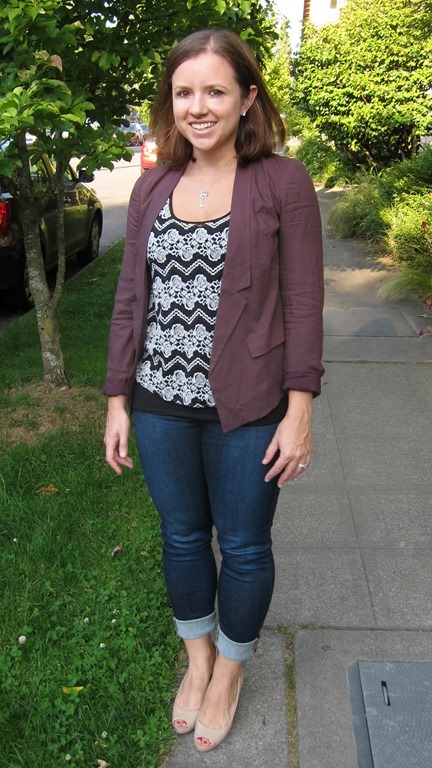 I picked up this top (thanks to Amy of LowCarbHighStyle! 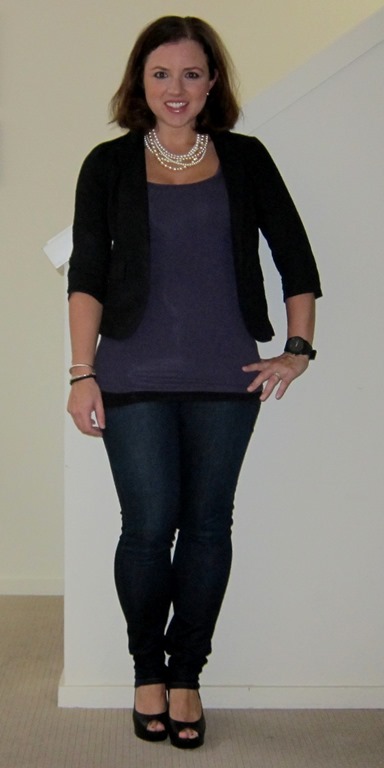 ), and paired it with my Minnie pants, a white blazer, a statement necklace, and black peep-toe pumps.